Before moving to The Villages in 2007, Villager Joe Flynn heard the massive retirement community was a predominantly Republican stronghold. The Villages remains a popular stop for state and national GOP candidates, and as much as Villagers enjoyed watching the debates that occur during an election year, some Villages Democrats say they feel isolated. Politics in The Villages is bound to get more intense with the Nov. 8 election around the corner, and Joe knows many Villagers—as well as millions of voters around the nation—are overly passionate about who they want as the next commander in chief in the White House. 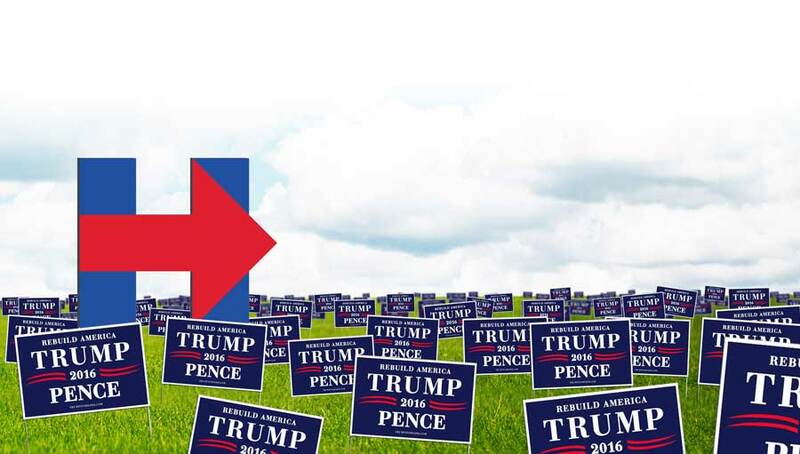 The Connecticut native is not shy about displaying a large “Hillary” sign on his golf cart, yet whenever his wife drives the vehicle, she removes the sign to avoid any kind of confrontation. “I really never got involved in politics until I moved to The Villages,” says Joe. He was a registered Independent when he owned his insurance businesses, yet during those years he felt a need to stay neutral about his political views. It was while engaged in conversations at one of The Villages town squares that he felt comfortable sharing his belief in Democratic values, and that inspired Joe to get involved with like-minded residents in the Villages Democratic Club. The group is now 1,800-members strong, and growing. However, Joe remembers when the club only had a couple hundred members. “We work around restrictions put on by The Villages,” Joe says of Democratic events, and the group makes efforts to bring in speakers, congressmen, senators, etc., and encourage residents to register to vote. Some club members provide transportation to get voters to their precincts on Election Day. Joe proudly notes many club members are involved as mentors to schoolchildren in Wildwood, yet politics is left at home and not brought to the school. The Villages Democratic Club hosts a social for Democrats and Independents—the Democratic Neighbors Orientation. They meet at 1:45 p.m. the first Sunday of the month at Colony Cottage Recreation Center. Upcoming socials will be Oct. 2, Nov. 6, and Dec. 4. Joe is eager to see the outcome of the November election. “It’s going to be interesting,” he says, adding he hopes voters of opposing parties can put their differences aside and come together, even if it means to agree to disagree. And as much as Joe enjoys the amenities of The Villages lifestyle, would he have moved here had he really known how strong the Republican Party is in The Villages?